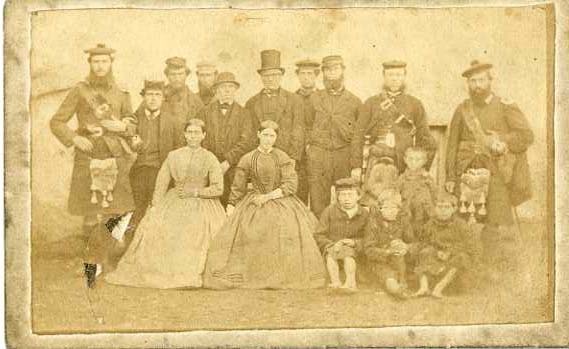 This recently donation to the heritage service shows a group photograph taken at Abhainnsuidhe Castle, Harris around 1867 or possibly earlier. The reverse of the images states “a set of Harris worthies for Aunt Ann. with copl[imen]ts R Mortimer” and indicates it was taken or developed by Hay photographers of Bridge Street, Inverness. The donor kindly did a fair amount of research into this small 3 ½ x 2 ¼ inch image. Ann is believed to be Ann Hosick of Montrose. She was gifted a scrapbook by her brother in law, Robert Mortimer, in 1866 in which this image originally sat. Robert and his wife Elizabeth (Ann’s sister), were in Harris in the late 1860s and had a daughter born there whilst Robert was clerk of works at the Castle. By 1871 they were living in Perth, probably working with the architect David Bryce who designed Abhainnsuidhe and who in 1871 was working on Meikleour House in Perthshire. The three kilted men are believed possibly to be Atholl Highlanders from the Perthshire estate of the Duke of Atholl at Blair Atholl. Charles Murray, 7th Earl of Dunsmore, for whom Fincastle was built, was a Officer in the Atholl Highlanders. Maybe he invited some of the regiment (who were the private army of the Duke of Atholl and largely ceremonial) over to Fincastle to add a bit of pageantry to an event? The identities of those in the photographs are unknown but, judging by the Wikipedia page for the 7th Earl of Dunsmore I wonder if he is the gentleman in the kilt on the right. It is likely one of the women is Elizabeth Mortimer and that Robert (possibly in the top hat?) and his bare-footed children feature also.